Iran’s “Death to America” chants are aimed at President Donald Trump and the U.S.’s other “rulers,” and will continue to be used at state-organized rallies and events, Iranian supreme leader Ayatollah Ali Khamenei said. ” ‘Death to America’ means death to Trump, [national security adviser] John Bolton, and [Secretary of State Mike] Pompeo. 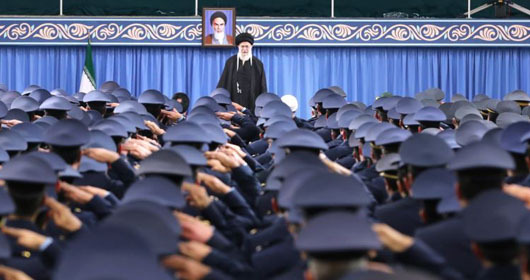 It means death to American rulers,” Khamenei said in a Feb. 8 speech to a gathering of Iranian Army Air Force officers marking the 40th anniversary of the 1979 Islamic Revolution. “The U.S. regime is the embodiment of evil and violence; a crisis-maker and a warmonger,” Khamenei said. “The U.S. regime’s existence has always … depended on encroachment aimed at securing its own interests. Iran’s Islamist regime has consistently used the term ‘Death to America’ over its four decades in power regardless of which U.S. political party occupied the White House. Iran “will continue to chant the ‘Death to America’ slogan as long as the U.S. remains evil and wicked,” Khamenei said. Tensions have been on the rise between Iran and the United States following Trump’s decision last year to withdraw the U.S. from the 2015 nuclear deal and reimpose tough economic sanctions on the Islamic Republic. In his Feb. 8 speech, Khamenei also said that European nations, many of which are attempting to salvage the nuclear deal, could not be trusted. Britain, France, and Germany recently unveiled a mechanism that allows firms to trade with Iran without falling foul of U.S. sanctions as a means to supporting “legitimate trade” with Iran. The move has been welcomed by the European Union, which has criticized Iran over its “destabilizing” ballistic-missile program, its “hostile activities” in several EU member states, and its meddling in countries in the Middle East.